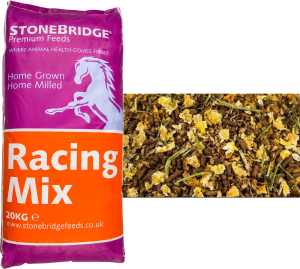 Stonebridge’s Racing mix is a highly palatable muesli, especially formulated for Racehorses of all ages to promote and sustain high levels of performance. To meet the high demands of training and racing, special proteins, minerals and vitamins have been selected to complement the low starch, high fibre and high oil base of the mix. The mix also contains Yea-Sacc1026 and Mycosorb to aid digestion and detoxify the horse‘s system. Alfalfa has been added because of its naturally high soluble fibre content for energy and easily digestible protein. It is also an excellent source of naturally available vitamins and minerals. vitamin E & selenium (selplex). overall utilization of feed ingredients. Aids palatability and binds the vitamins, minerals etc.